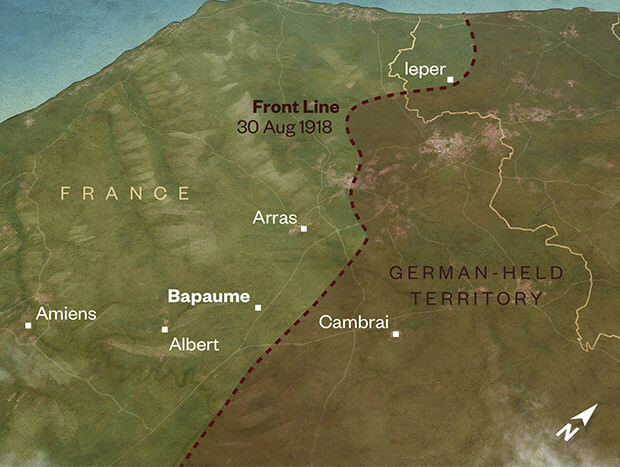 As the British, French, and German armies dug in across Europe in 1914, battle lines were drawn - creating the sprawling war zone that became known as the Western Front. It wasn't until 1916 that the New Zealand Division arrived to take part in the fighting. After the failed Gallipoli campaign, the New Zealand Expeditionary Force (NZEF) formed its own infantry division and became the New Zealand Division. It arrived on the Western Front in 1916, totalling 15,000 men and settled in Armentières. Located near the frontline, many battles were fought around the outskirts of Arras. Briefly held by the Germans in 1914, the town was retaken by the French and later taken over by the British. The New Zealand Tunnelling Company arrived in France in March, 1916, and were the first New Zealanders to arrive on the Western Front. Moving to Arras in November 1916, they began work, alongside the British, on expanding the existing caverns and tunnels underground, resulting in a vast underground network. 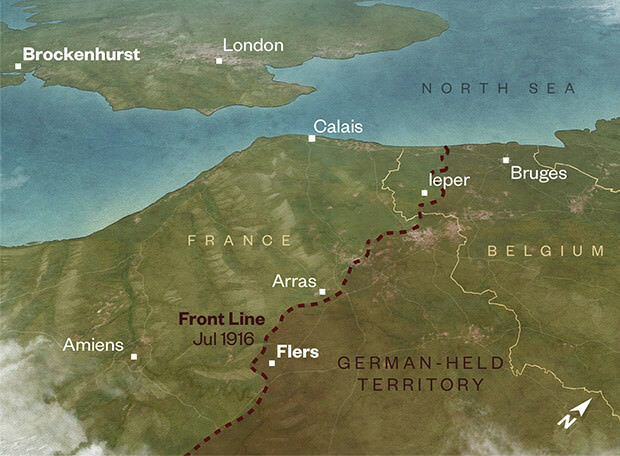 Armentières saw heavy fighting in 1914 as the Franco-British and German armies clashed in what was termed ‘a race to the sea’, with each side trying to dominate key positions all the way to the English Channel. By 1916, Armentières had quietened down and the New Zealand Division was sent there. Armentières was considered a ‘nursery area’ - perfect for a new division. The New Zealanders billeted in the town and had plenty of interaction with locals, while learning to fight the nearby Germans - giving them a taste for life on the Western Front. In 1917, the New Zealanders lived at Plugstreet in tunnels and deep shelters, dug by the Australians, in the hills and surrounding area. Here, they prepared and trained for the attack on Messines Ridge. 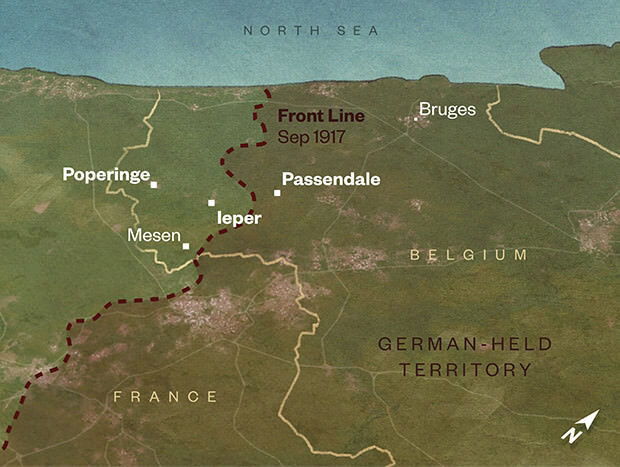 On 1 July 1916, the Somme Offensive began - one of the largest battles of the war. The British and French had amassed their armies and planned to push the Germans back - inflicting as many casualties as they could, while relieving pressure on the French armies at Verdun. The New Zealand Division was first brought to the Somme to participate in the Battle of Flers-Courcelette, and this was their first major action of the war. On 15 September 1916, the New Zealanders launched their attack against the Germans near the village of Flers. This was also the first time in history that tanks were deployed in battle. In response to the scale of the war and the wounded, a huge network of medical facilities and hospitals were established, stretching all over Europe and eventually reaching almost every country involved in the fighting. In England, the town of Brockenhurst was home to a large New Zealand Hospital complex, with the No.1 New Zealand General Hospital the main centre. Wounded soldiers were evacuated from the Western Front, and brought back to Brockenhurst for further treatment, receiving expert care with modern facilities. The June offensive at Messines, involving the British 2nd Army, commanded by General Plumer, planned to capture the Messines Ridge and deny the Germans the dominant high ground. It involved months of careful planning, including artillery and infantry tactics, and over a year of mining operations. The New Zealand Division was a part of the offensive, and early on the morning of 7 June, they were ready - in the forward trenches, to advance and take their objective - the southern part of Messines Ridge, and the village. 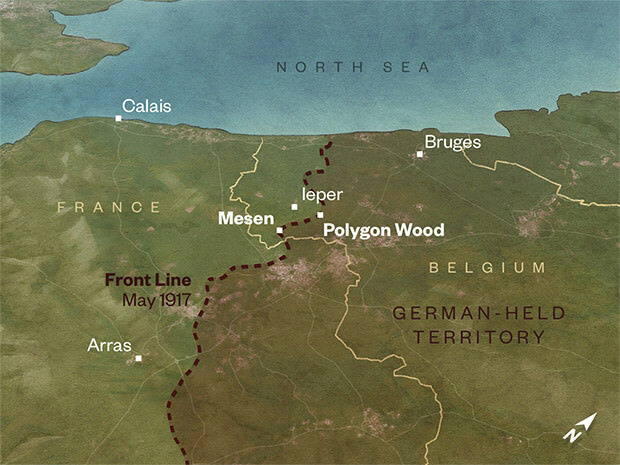 Part of the Ypres Salient, the Polygon Wood sector saw heavy fighting during the war. Originally held by the British, the Germans took it in 1915 and the ground wasn’t won back until September 1917 - when the Australians took and held it. In October 1917, after the battle of Passchendaele, the New Zealand Division wintered at Polygon Wood until early February 1918. For the months that the New Zealanders were here, they trained and prepared their men and officers for the battles to come. They also launched an attack at the German strongpoint of Polderhoek Chateau. The Third Battle of Ypres - known as Passchendaele, was a British-led offensive that hoped to push the Germans off the high ground which dominated the area around the Ypres Salient. After success at Messines, morale was high among the Allies and many thought that the Germans were near breaking point. 4 October was the beginning of the attack for the New Zealand Division - and they took Gravenstafel Ridge. 12 October was their next major attack - on the town of Passchendaele itself, but things did not go to plan. In the Ypres Salient in Belgium, the war raged constantly. The Germans occupied the high ground on the outskirts of the town shelling the British regularly, and bombing them from the air, destroying many buildings and taking many lives. Inside the town of Ypres and nearby at Poperinge, New Zealand medical staff, and the Light Railway Company worked overtime, attending to wounded soldiers, and bringing up supplies and ammunition to support the war effort. The Second Battle of the Somme came as a response to the German Spring Offensive in March. The German launched a series of huge attacks across a wide front and quickly gained ground. 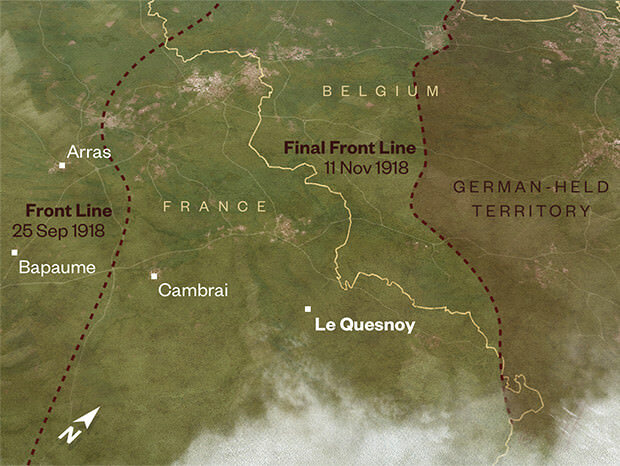 The Allies desperately needed to hold the line and plug any gaps to stop the British armies being isolated from the French. The New Zealand Division was rushed to the Somme region to help stop the German advance. 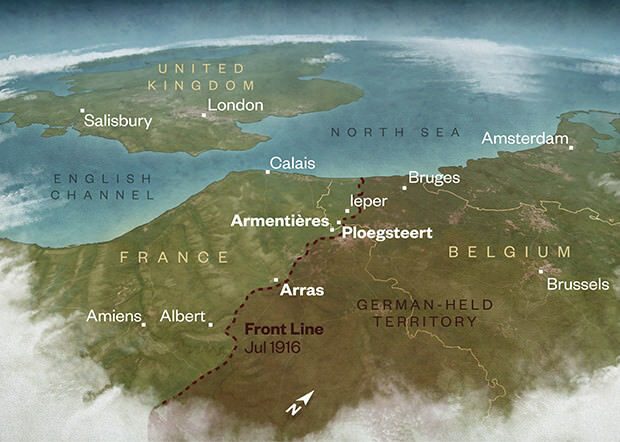 By August 1918, the Allies were ready to counterattack - and drive the Germans back. Still in the Somme region after helping to stop the German advance, the New Zealand Division was involved in the attack on Bapaume - which launched the second Somme offensive. In the final weeks of the Hundred Days Offensive in 1918 - the Allies had almost pushed the Germans out of France. The Germans had been conducting a fighting retreat, but their supply lines were cut and their armies near exhaustion. Only a few pockets of resistance remained. As the Allies pushed forward, the New Zealand Division had advanced and all but surrounded the town of Le Quesnoy, but the German garrison still refused to surrender.